Panama Jack Resorts Cancun is an all-inclusive, beachfront resort located in beautiful Cancun. The unique Mediterranean-style is popular with families and couples looking for a fun, informal vacation atmosphere. Special features include spacious junior suite and villa accommodations, two freshwater pools, nine restaurants, a variety of bars and lounges, a spa with hydro-therapy areas and massage services, a supervised children's club and T-Zone for teen guests, and Panama Jack Resorts Cancun's exclusive 24-hour all-inclusive club. Guests of all ages will delight in a host of day and nighttime activities, including theme parties and live entertainment. 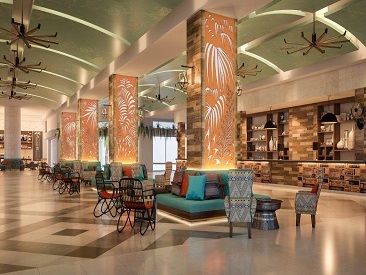 Relax and reconnect with friends and family of all ages on a stretch of pristine beach in the heart of Cancun's famous Hotel Zone. In this picture-perfect escape, activities range from beachfront Zumba to culinary classes to live music; each day promises new experiences, friendly staff, delicious dining and amazing adventures. Kids of all ages will enjoy 'Camp Jack', which includes mini golf and a water park and adults will appreciate the SPAreal hydrotherapy experience. When it's time to dine, gourmet restaurants and oceanfront bars serve an array of international cuisine and cocktails. 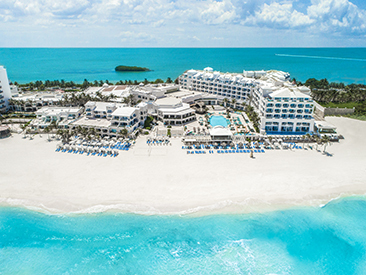 An all-inclusive paradise with white sands and blue waters await! The SPA offers a selection of spa treatments for men and women including facials, massages and other rejuvenating body treatments. Steam and sauna rooms and a full-service beauty salon are available. Spa and beauty services incur an additional cost. A complimentary fitness center contains cardio machines, a Universal gym, free weights and a special aerobics exercise floor. Panama Jack Resorts Cancun's complimentary, supervised 'Camp Jack' is available for children 4-12 years old. Plus family-friendly accommodations are available allowing up to 3 children in the same room with two adults. Book at least a 3-night stay in a Junior Suite or higher and receive a 50% discount for unlimited all-inclusive golf! See ‘Activities' tab for more details. Honeymooners who present a marriage certificate receive a bottle of sparkling wine, flower petals in your suite and other special amenities. 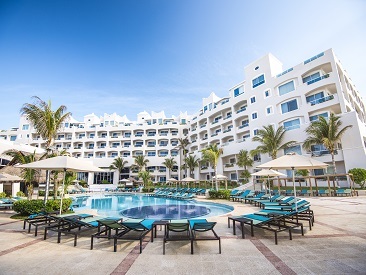 Guests who celebrate their wedding at Panama Jack Resorts Cancun can also enjoy this free package when returning for their first wedding anniversary!